The Trump economy got off to a good start in 2017. And the president has a simple message: America is great on my watch. "The world is witnessing the resurgence of a strong and prosperous America," Trump said in front of world leaders, CEOs and the press at the World Economic Forum in Davos, Switzerland, Friday. The U.S. economy grew 2.3% last year, according to figures released Friday. That's the best growth in two years. Consumers, small business owners and CEOs are confident partly due to President Trump's agenda. He and congressional Republicans delivered a major tax cut for corporations and individuals, and some companies have promised bonuses or raises for employees as a result. Many more are hinting at bigger payments to shareholders. Some foreign companies, like Samsung, have also opened up new factories in the United States too. But there's another undeniable force behind the strong American economy: the global economy's own resurgence. 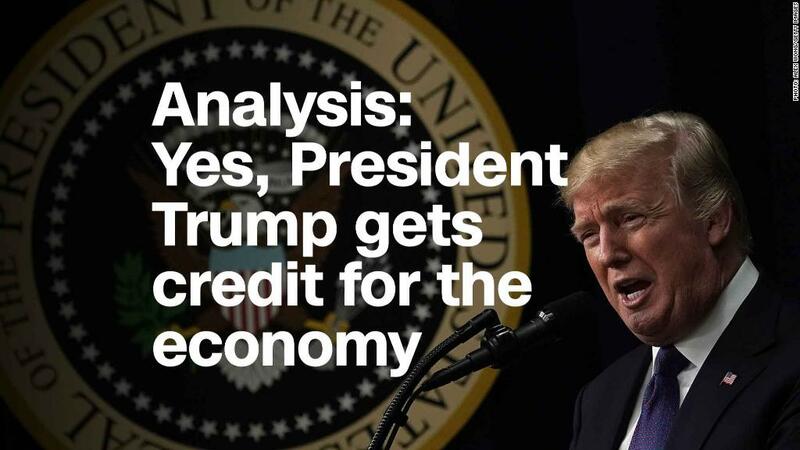 Its comeback last year helped boost at least two things Trump takes sole credit for: Jobs and stocks. The global economy grew 3.7% last year, its fastest pace since 2010, according to new estimates from the IMF. One especially rare thing happened in 2017: Every major country or region grew, from China to Europe to Latin America to Japan. Europe's economy is firing on all cylinders. China's growth is stable. Japan is finally on the rebound. And Latin America's big players (excluding Venezuela) have emerged from recession. A lot of U.S. companies sell their products in those markets. A healthier global economy lifted the profits of American companies. Higher sales and profits helped to boost U.S. stock markets to records last year. But global growth matters to the American economy, especially for one sector Trump wants to expand: Manufacturing. American exports rose 5.5% last year. That may not sound like much, but it's a major turnaround from an export decline in 2016. And manufacturing depends heavily on selling planes, cars, medical equipment and other goods around the world. As exports rose, American factories added nearly 200,000 jobs last year. A year earlier, U.S. manufacturers were cutting jobs. A key factor for manufacturing companies is the value of the U.S. dollar. A weaker dollar makes American products more affordable to foreign buyers. The dollar lost about 10% of its value last year. Other currencies around the world became more valuable, after central banks pulled back stimulus and economies became healthier. Meanwhile, economists, even at the IMF, anticipate that U.S. tax cuts will boost the economy this year -- but they won't be a long-term game changer. They predict growth will return to a ho-hum level slightly above 2% by 2019 or 2020. That expectation has dragged the dollar even lower. Trump told CNBC Thursday he expects the dollar to get "stronger and stronger" in the future, alluding to the economy's gains under his watch. Since the start of the year, it's down 3.3% to its lowest level in three years. Again, economists point to other countries' economies catching up. Economic growth in Year 2 of the Trump economy may even be better. The IMF predicts 2.7% growth in America. If it gets there, the rest of the world can take credit too. IMF officials see global growth rising again this year to 3.9%.